Mike McKenzie spent most of his non league playing days over at Stalybridge Celtic as well as spells with Droylsden and Prestwich Heys but it is fair to say his most remarkable achievements were with the Sunday side Astro who dominated the North West for over a decade. Injury forced Mike to concentrate on managing the side and he was soon given a chance at Winsford United where he presided over arguably the clubs greatest period. A move to Conference side Witton Albion was the only blot on Mike's managerial page and he became the Hyde manager in 1994. He got off to a great start, fighting through to the FA Cup 1st Round and FA Trophy semi final in his first season and the Trophy semis again in his second. League positions were always excellent and the only real dissappointment was that his sides always fell just short of the NPL championship. His stewardship brought Trophies to the club and were generally considered good times although in the last year or so things became difficult as playing budgets shrank. 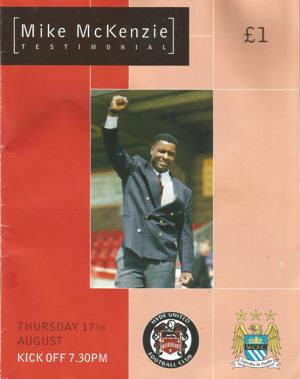 Mike had a Testimonial game against Manchester City on 17th August 2000.